The civil rights movement's most prominent leaders, Martin Luther King, Jr. (1929-1968) and Malcolm X (1925-1965), represent two wings of the revolt against racism: nonviolent resistance and revolution "by any means necessary." 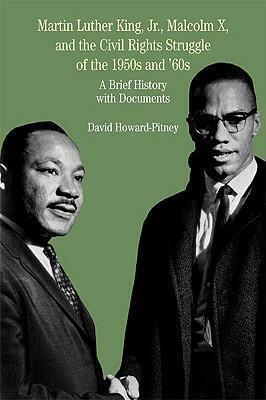 This volume presents the two leaders' relationship to the civil rights movement beyond a simplified dualism. A rich selection of speeches, essays, and excerpts from Malcolm X's autobiography and King's sermons shows the breadth and range of each man's philosophy, demonstrating their differences, similarities, and evolution over time. Organized into six topical groups, the documents allow students to compare the leaders' views on subjects including integration, the American dream, means of struggle, and opposing racial philosophies. An interpretive introductory essay, chronology, selected bibliography, document headnotes, and questions for consideration provide further pedagogical support. "The Bedford Series in History and Culture "not only introduces students to some of the most vital primary documents in American history, but the thoughtful introductions provide the most recent, provocative, and accessible interpretations of their subjects." DAVID HOWARD-PITNEY has taught American history and American studies at San Jose State University and the University of Wisconsin-River Falls. He is now professor and history department chair of De Anza College. He worked at the Martin Luther King, Jr. Papers Project at Stanford University in 1986 and from 2000 to 2002 was a commissioned scholar for the Public Influences of African American Churches Project of the Leadership Center at Morehouse College. A specialist on American civil religion and African-American leaders' thought and rhetoric, Howard-Pitney's publications include The African-American Jeremiad: Appeals for Justice in America.